Standing in the magical Dinefwr estate, Newton House was built in 1660, and altered in the 18th and 19th centuries. The house as it is presented to visitors today is how it looked in 1912. The house is set in magnificent 18th century gardens and parkland laid out by George and Cecil Rice. Among the highlights in Dinefwr parkland is a herd of white cattle that have roamed the park for over 1000 years. So important were the white cows of Dinefwr that they could be used as currency to pay a fine to the king. 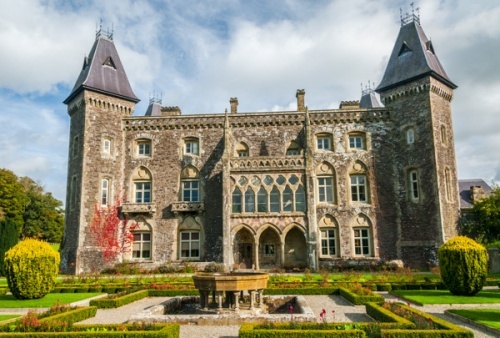 The Dinefwr site has been in use for well over 2000 years. There was an Iron Age farm in the park, a pair of Roman forts, and a planed town founded by Edward I. A short walk through the wonderful parkland takes you to the ruins of 12th century Dinefwr Castle, used by the powerful Welsh prince, Lord Rhys. When Rhys ap Gruffydd was executed for treason by Henry VIII in 1531 the family changed their name to Rice, and set about buying back all the lands seized by the crown. By 1659 they had succeeded, and Edward Rice began to build an elegant new house in Jacobean style on the site of a medieval mansion. Then, in the 18th century George Rice and his wife Lady Cecil Talbot began to recreate the ancient parkland as a picturesque landscape garden, with the romantic ruined castle on the hill acting as a ready-made focal point. They called in Capability Brown in 1775, and Brown helped design the sinuous path that winds through the park, with specimen trees planted to frame views of the house and castle. The landscape gardens surrounding Newton House were one of the most influential in 18th century Britain; they were frequently painted and the subject of much discussion in fashionable social circles of the time. Fashions come and go, and so it proved with Newton House. In the 1850s the house was given a makeover to create a mock-Gothic look. So, though the core of the house is Jacobean, and some ceilings survive from that period, much of what we see today dates from the mid-Victorian and Edwardian periods. The interiors are best described as comfortable rather than sumptuous, with lovely furniture and artwork. One of the most interesting pieces of art is 'Mary, Queen of Scots Bidding Farewell to France, 1561', by William Powell Frith, depicting the unfortunate queen in a very romanticised Victorian pose. Another striking painting by a better known society portrait artist shows William Talbot, in his role as Bishop of Salisbury and Chancellor of the Order of the Garter, painted by Godfrey Kneller in 1718. The house is also said to be haunted; in fact it is supposedly the most haunted house in the care of the National Trust and has featured on the TV programme 'Most Haunted'. We really enjoyed out visit to Newton House (unfortunately we weren't allowed to take interior photos). The house is fascinating, both for what it is today and for the long history of the house, the gardens, and the castle. 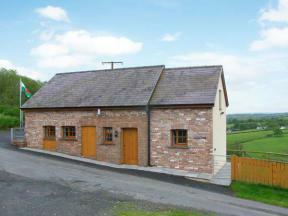 This detached cottage situated near the town of Llandeilo sleeps four people in two bedrooms. This lovely detached cottage is in the village of Llandybie near Llandeilo and sleeps twelve people in six bedrooms.